A band saw is a common power tool used to cut tough materials and it requires proper training for operation. One of the most common causes of the equipment to be damaged is incorrect configuration of the saw tracking on the wheel and the alignment of the upper and lower wheels. In case something is not right with the adjustment, here are the steps on how to correct it. However, keep these in mind before doing the procedure. Always wear protective gears such as eye goggles. Make sure that you’ve read the manual thoroughly before making adjustments. Make sure that the band saw is unplugged from the power source. In this part, you will learn how to make sure that the blade is riding at the crown, curved part at the wheel surface that allows the blade to remain at the center. This will also teach you how to correct it in cases of errors. First, loosen the upper and lower blade guides so it does not make contact with the blade to avoid affecting the adjustment. Having the right amount of tension on the blade will help simulate operating conditions. This can be adjusted by pulling the quick release lever up to a vertical position and turning the blade tension adjustment knob until the red marker is at the tension scale’s correct line for the width of the installed blade. Pull the lever down to a horizontal position to apply the tension. Seeing that the blade is out of the crown, the blade tracking adjustment knob is responsible for the tilt and center tracking of the blade. Simply unlock it, spin the upper wheel with one hand and turn the blade tracking adjustment knob with the other until the blade rides consistently at the center then lock the knob. Close the cover and readjust the blade guides based on the configuration defined on the manual. 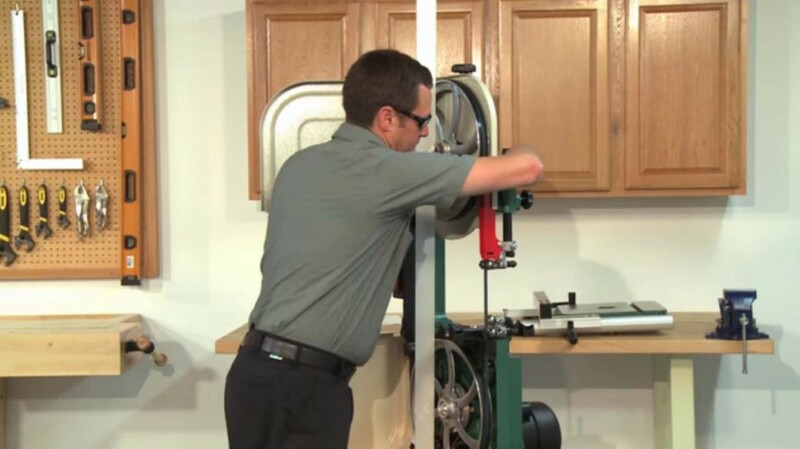 When the wheels of the band saw are not aligned properly, the functioning of the equipment is actually compromised. In order to correct and make sure that the wheels are on the same plane, coplanar, and parallel with each other, you need a long straight edge, a fine ruler, a set of hex screws, and a wrench or socket. Open the upper and lower wheel covers, the blade, and the table. Reinstall the blade and ensure proper tension. Place the straight edge at the center of the wheel then use the blade tracking knob located at the back to adjust the upper wheel to be vertically parallel with the lower wheel. In case the upper wheel is tilted side-to-side, simply remove the blade and the wheel. Then, thread one screw in and another screw out in the same amount to adjust the wheel’s lateral alignment. Be sure to make little adjustments only as this may already give big effect on the wheel position. Reinstall the wheel and the blade. If one of the wheels is further back such as the lower wheel, shimming might be needed to bring it forward. 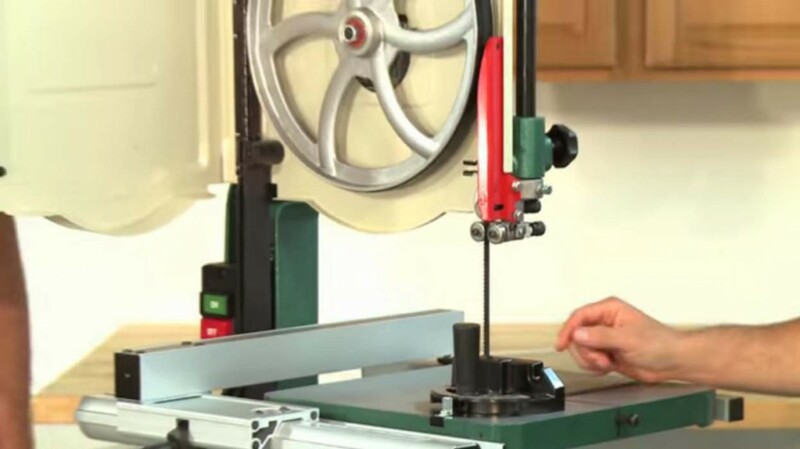 The amount of shim washers to be applied is determined by placing the straight edge at the center and measuring with a fine ruler the gap between the edge and the wheel’s rim. Once again remove the blade and the lower wheel, place the appropriate amount of shim washers. Reinstall the wheel and tighten the shaft knot. Reinstall the blade and apply proper tension. Verify if indeed the wheels are now parallel and coplaner. Regular maintenance and checking of the equipment helps to detect any faults on the machine and it also allows prompt repairs before it gets totally wrecked.